BOAT OWNER'S NOTES for 1980 CHRIS CRAFT 350 Catalina, Call John at 434-990-1943, regarding a Chris Craft 350 Catalina $24,700. 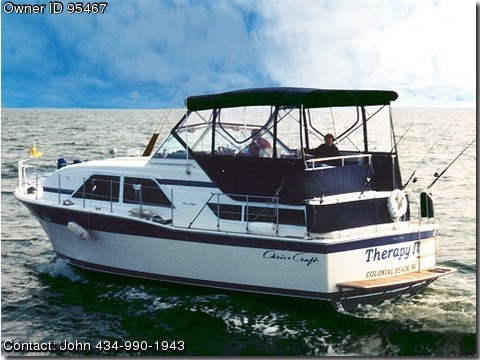 OVERVIEW: This boat (christened THERAPY IV) is one of the early Fiberglass Chris Crafts, launched in 1980, and is currently berthed in Northern Neck, Virginia, THERAPY IV provided great therapy for the “Captain” and his spouse and served our country as a USCG Auxiliary Safety Patrol Boat from 2003 - 2008 performing vessel facility inspections and is USCG Documented. ENGINES: The 3 blade propeller is powered by two rebuilt 270 HP inboard GM 350s with less than 100 hours use provided effortless cruising at 14 knots and 24 knots max anytime it was needed, fueled by 175 gallon tanks. FEATURES & EQUIPMENT: The hull is a Modified Vee, with a 35 foot length and 13 foot beam, dry weight is 17,229 pounds, with accommodations that include a great fully equipped galley area with Oven and Electric Range 3 burner Princess stove, Microwave and full-size refrigerator, 4 twin berths for comfortable sleeping, 2 cabins, and 1 Marine head w/holding tank w/deck pump-out, including lavatory and shower w/hot water. ELECTRONICS & EQUIPMENT: Depth finder, log-speedometer, compass, GPS, ICOM VHF w/hailer, a DVD player, an Electric bilge pump, 2 - Zone Air conditioning Heat/Cooling, shore power inlet, Onan 6 point 5 Generator, and for rigging a steering wheel. OUTSIDE FEATURES: Cockpit cushions, Swim platform w/boarding ladder, Bimini Top, Fume and CO2 detector, and Danforth anchor. If you have any questions about the 1980 CHRIS CRAFT 350 Catalina by all means call me @ 434-990-1943.